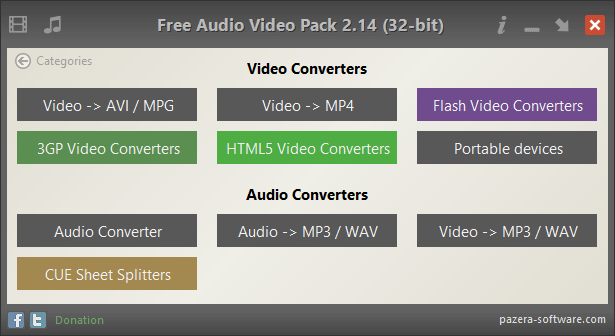 Free Audio Video Pack is Portable Media Converter tool created by Pazera Software. This awesome collection of portable audio and video converters can convert media between just about every format. Media format conversion between AVI, MP3, MP4, FLAC, MOV, WMV, WMA, FLV, 3GP, OGG, WebM are supported. For example you can use this tool to convert video formats from AVI to MPG, MKV to MP4, FLV to AVI, FLV to MPG, MP4 to AVI, MP4 to MPG, MOV to AVI, MOV to MPG, 3GP to AVI, 3GP to MPG, WebM to AVI, WebM to MPG. Or for example to convert audio formats from FLAC to MP3, FLAC to WAV, MP4 to MP3, MP4 to WAV, M4A to MP3, M4A to WAV, APE to MP3, APE to WAV.